It seems that any time any public figure discusses their own experience with abortion, it's wrapped in a thick shell of regret and explaining the whys and hows and extraordinary circumstances of why there were no alternatives. But the Democratic nominee for Nevada lieutenant governor is flipping the script. She had an abortion because she simply wasn't ready to have a baby. And she doesn't regret it. 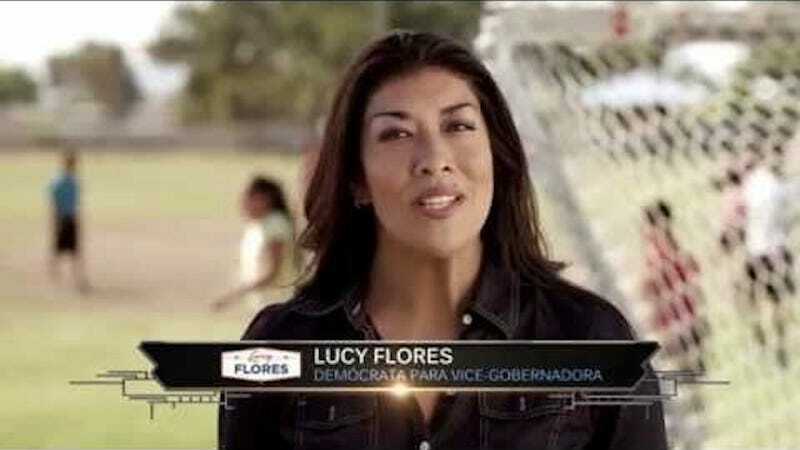 Lucy Flores was one of 13 children raised in impoverished conditions. When she became pregnant at age 16, she asked her father for money for an abortion because she didn't want to end up like her six sisters who had also gotten pregnant as teenagers. After the abortion, Flores spent time in prison before turning her life around, eventually attending USC and entering politics. She openly discussed terminating her pregnancy during a floor speech while she was serving as a state legislator, and openly supports the right for other young women to have access to the options she did (for more on her impressive trajectory, check out MSNBC's Benjy Sarlin's recent profile of Flores). Pretty refreshing, considering (as Slate's Amanda Marcotte points out) how female politicians who admit to terminating pregnancies usually do so in the context of heart wrenching stories of wanted pregnancies and serious, unforeseeable medical issues. Those are legitimate reasons to terminate, certainly, and it would take a truly heartless person to refuse to acknowledge that. But most abortions don't occur late in pregnancy, and aren't the result of tragedy, and that's okay. Hopefully, win or lose in November, Flores's bravery in sharing her story will help remove the stigma around a legal medical procedure that has been a true lifeline to women who, for one reason or another, simply don't want to carry a pregnancy to term.